Almost 60 brethren assembled at Warrington Masonic Hall to see Paul Santus (WM) proclaimed as master for a second year in the chair of King Solomon in Boteler Lodge No 7367. Kevin Poynton (left) and Paul Santus (WM). Paul opened the lodge and the usual administration duties were undertaken, the lodge was then opened in the second and third degrees. Paul Hankey, director of ceremonies was admitted and reported that the principal guest Kevin Poynton was without and demanded admission. The WM said he would be delighted to receive him. Kevin was admitted in true ceremonial style accompanied by Gordon Amos, Stan Churm, John James, Chris Eyres and Andy Barton (Warrington Group Chairman), all of whom are grand officers along, with David Dutton and Stephen Clarke, both acting Provincial grand officers. Upon a request from the WM, George Bennett occupied the WM’s chair, Bill Hinchliffe the SW’s chair, Ray Williams the JW’s chair and Stephen Clarke the IG’s chair. All brethren under the rank of an installed master retired for a short time and Paul Santus was proclaimed as WM for the second year and resumed his rightful place in the lodge. The third degree working tools were presented by Rod Wilson; the second degree working tools were presented by Barry Hodson and the first degree working tools were given by Jonathan Wood. Addresses were given by Bill Hinchliffe to the WM, to the wardens by George Bennett and to the brethren of the lodge by Kevin Poynton. Pictured from left to right, are: Kevin Poynton, Jonathan Wood, Paul Taylor, Sam Rigby and Paul Santus. The principal guest, Kevin, was presented with charitable donations for the sum of £900 to the MCF 2021 Festival, £300 to St Rocco’s Hospice, Warrington, £200 to the Warrington Masonic Hall Fund and prior to the meeting £375 to Derian House Children’s Hospice, £165 to the charity plate envelopes split between MCF 2021 Festival and West Lancashire Masonic Charities and finally £225 to Boteler Lodge widows at Christmas. All donations totalled £2,165. Kevin on his own behalf congratulated Paul on the start of his second year in the chair and conveyed the good wishes of Tony Harrison, the Provincial Grand Master for a happy and successful second year. Kevin also congratulated everyone who took part in the ceremony and made special reference to the younger brethren presenting the first degree tools. As is custom in this lodge and in keeping with its reputation for excellent dining, the social board was a fabulous affair starting with a selection of hot and cold canapes, followed by coarse pate with melba toast, cod mornay, beef Wellington with potatoes and seasonal vegetables with tiramisu as dessert. A premium cheese board and biscuits followed with tea or coffee. The meal was accompanied by two fine wines, Macon or Chianti. Certainly not an evening on which to start the diet! Pictured left: Gwilym Jones singing the master’s song to Paul. Middle: Kevin receiving a bottle of Champagne. Right: Andy receiving his bottle of rum. In a short speech, Kevin congratulated everyone taking part in the ceremony and again commented on the younger brethren delivering the working tools, Paul on his outstanding work in the lodge last year and his hopes for the ensuing year. He also congratulated the director of ceremonies for his control of such a good evening. 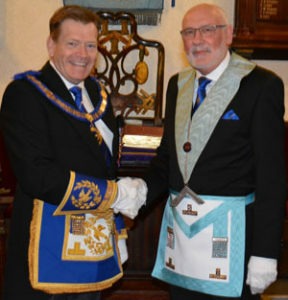 Paul who is 71 years of age and just starting out on his second consecutive year as master, was initiated into Freemasonry and Boteler Lodge in November 2010. A retired plumbing and heating engineer by trade, he ran his own business for many years. Along with his wife Millie they are active church and choir members in their local village of Hoghton, near Preston, as well as being involved with local amateur dramatics. Paul’s son Darren is also a member of Boteler Lodge. The master’s song was eloquently sung by Gwilym Jones, excellently accompanied by Brian Hoyle. A raffle was held after the meal which generated £392 for charity. At the close of an excellent evening Paul presented a bottle Champagne to Kevin, whilst the group chairman was given a bottle of Pusser’s Rum, a favourite of Andy’s wife Kath, brought back from the British Virgin Islands by George Bennett (lodge secretary). Pictured from left to right, are: Stephen Clarke, Stan Churm, Kevin Poynton, Jonathan Wood, Paul Taylor, Sam Rigby, Paul Santus, Andy Barton, George Bennett and David Dutton.